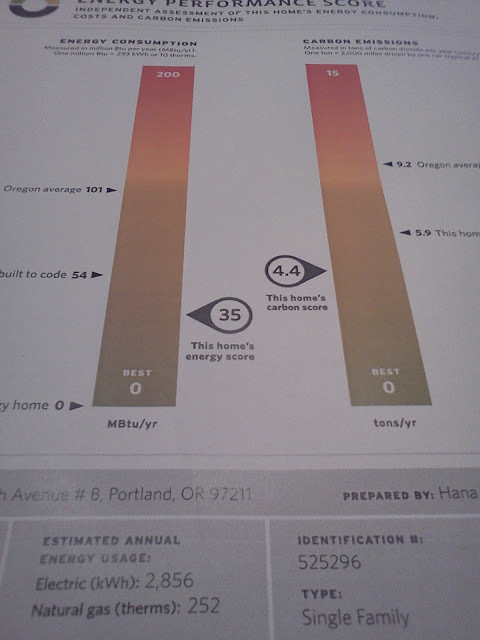 Cost is a big issue for homeowners who want to build ADUs and I am committed to being transparent about the costs of my project. So, now that the project is "done", this post deals with the total project cost. In the end, my total costs ended up being $96,238, which is $120/sq. ft. The total cost for designing, permitting, and building the ADU was $96,293. I had initially aimed to complete the project at $100/sq ft, but I suppose that my cost overrun was somewhat expected. As I wrote in my first 'time and cost' blog post, it is a rule-of-thumb that a project will end up costing 20% more than what was expected, and that it will take twice as long as expected. 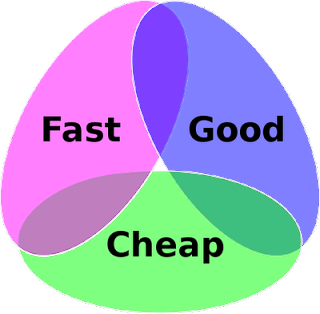 Well, the project came in on time, and it came out qualitatively great, but it cost 20% more than I had anticipated, confirming the Project Management Triangle adage. You can build a high quality project at low cost, if you have lots of time. You can build a high quality project in little time if you have lots of money. You can build quickly and cheaply if you do not expect great quality. 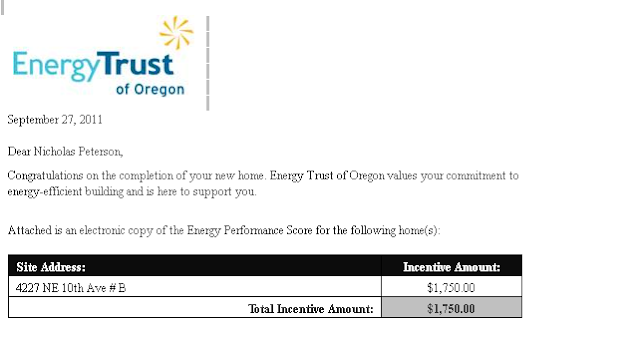 On the bright side, due to the excellent thermal performance of the building (it is projected to use 1/3rd the amount of the energy of an average Oregon home), the Energy Trust of Oregon gives me $1,750 rebate-- no chump change. I anticipate that I'll get another $1,000 back in energy incentives for the appliances that I purchased from the Oregon Department of Energy via tax credits. I will go into greater depth on this cost and rebates in my upcoming ADU class. 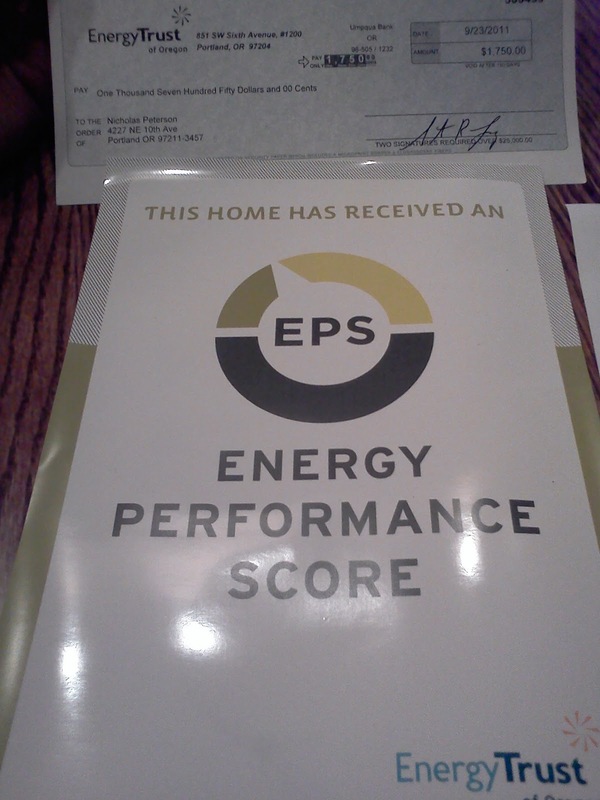 My other posts about financing, the permit costs, and the financial payback may be helpful to others as well. Using the approach that I am using (moving into the ADU and renting out the the main house) means that I will likely live the rest of my life without any rental/mortgage expenses. What an amazing feeling of freedom to have at my age. 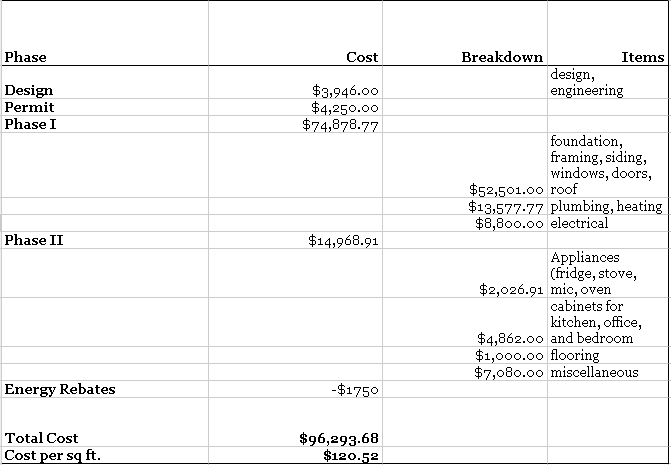 Assuming that it would cost me $1,000/month to rent an equivalent space, the payback period on the ADU is 8 years. My main house rents out at a rate higher than the mortgage payment, so in addition to paying for its own mortgage, it's providing some additional income. Of course, this ADU model is not going to work for everyone who builds an ADU, but it is certainly a compelling option for some people with access to the upfront capital, who are excited about living in a smaller space and renting out their main house. I do not mean to pitch ADUs solely as a vehicle for financial freedom, but my story proves that this financial model to live at no cost is totally attainable with an ADU. There are many reasons to build ADUs: boosting the local building sector, providing green jobs, providing urban infill housing, reducing municipal infrastructural demands, building community, creating more comfortable multi-generational housing options for families, affordable housing, building smaller spaces for energy efficiency, and reducing climate impacts. Personally, what I like about ADU's best is that they are a significant way that an individual can make a difference in terms of growing and developing smarter urban spaces. Typically, smart growth is "done" by developers, financiers, and municipalities- big actors in the land development world. With ADUs, smart growth can be promoted at the block level by an individual. An ADU can be a grass roots, contextualized, organic, hyperlocal form of development, providing a better residential development alternative to sprawl. But, if none of the ethical or academic justifications are compelling enough, it doesn't hurt that ADU's are almost definitely going to be a source additional income or residential flexibility for anyone who is able to build one.